Two pea-sized bones, called sesamoids, are embedded within the soft tissues under the main joint of the big toe. Even though they are small in size, the sesamoids play an important role in how the foot and big toe work. If the sesamoids are injured, they can be a source of severe pain and disability. Where are the sesamoids, and what do they do? The main joint of the big toe forms the inside edge of the ball of the foot. The two small sesamoid bones are located on the underside of this joint. There is one sesamoid bone on each side of the base of the big toe. 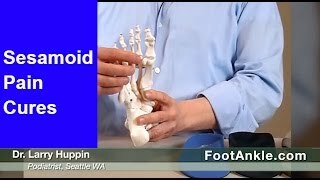 The muscles that bend the big toe down (the toe flexors) pass underneath the main joint of the big toe, crossing over the bump formed by the sesamoid bones. 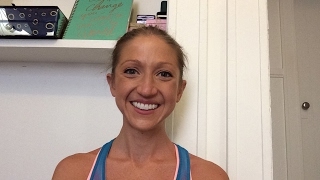 This bump acts as a fulcrum point for the toe flexors, giving these muscles extra leverage and power. 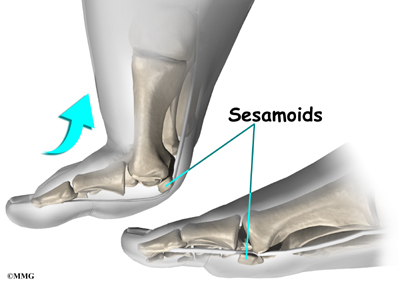 The sesamoids also help absorb pressure under the foot during standing and walking, and they ease friction in the soft tissues under the toe joint when the big toe moves. Sesamoid pain can develop a number of different ways. 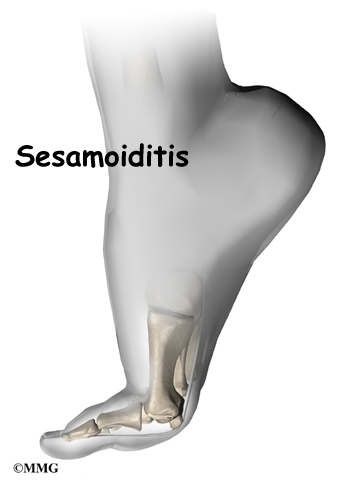 When the tissues around the sesamoid bones become inflamed, doctors call the condition sesamoiditis. Sesamoiditis is often caused by doing the same types of toe movements over and over again, which happens in activities like running and dancing. Fractures can also cause pain in the sesamoids. Fractures can occur when a person falls and lands bluntly on the ball of the foot. Stress fractures can also occur in the sesamoid bones. Stress fractures are usually caused by the strain of overworking the soft tissues. Athletes most often suffer stress fractures of the sesamoids because of the heavy and repeated demands that training places on the soft tissues of the foot and big toe. Arthritis can develop where the sesamoids glide under the bone of the big toe. The sesamoid bones create a joint where they move against the bone of the big toe. Like other joints in the body, this joint can also develop arthritis. Arthritis is more likely to be a problem in people who have high arches in their feet. The high arch causes the main joint of the big toe to become rigid. This focuses strain and pressure on the sesamoids. In some cases, blood supply to the sesamoid bone is decreased. This condition is called osteochondritis. Osteochondritis causes a piece of the bone to actually die. The body's attempts to heal the area may build up extra calcium around the dead spot. Sometimes sesamoid pain comes from extra tissue under the big toe joint, similar to a corn. Doctors call this extra tissue an intractable plantar keratosis. People with sesamoid problems usually feel vague pain under the main joint of the big toe. The sesamoids typically feel tender when touched. Movement of the big toe is often limited. People tend to notice pain mostly when their big toe is stretched upward, which can happen when the back foot pushes off for the next step. Occasionally the joint catches or pops. The catching or popping is often followed by increased pain, which usually eases after resting. Some people report feelings of numbness in the web of the first two toes. Your doctor will ask many questions about your medical history. You will be asked about your current symptoms and whether you've had other foot and joint problems in the past. Your doctor will then examine your painful toe by feeling it and moving it. This may hurt, but it is important that your doctor locates the source of the pain and determines how well the toe is moving. You may also be asked to walk back and forth. Your doctor will probably order an X-ray. The axial view gives doctors a good idea whether there are problems in the sesamoids. To get an axial view, the X-ray is angled to show the space between the sesamoids and the bottom part of the big toe joint. The X-ray image may show a sesamoid bone that looks like it is divided into two or more separate bones, as though it were fractured. This is normal in about 10 percent of people. If the small space between the bone pieces is smooth, it's probably okay. If the space is jagged, there could be a fracture. Further tests may be needed to make the diagnosis. Doctors may order a bone scan when the X-ray appears normal, or if there is a question about whether the division inside the bone is a fracture. A bone scan involves giving intravenous agents that travel through the blood and then show up in a scan. The agents accumulate in areas where there is a great deal of stress to the bone tissue. More intravenous agents will likely appear on the painful sesamoid bone than on the sesamoids of the other foot. Your doctor may want to do other imaging tests, such as magnetic resonance imaging (MRI). An MRI scan may help determine whether the bone is infected. More testing may help to make the final diagnosis. Many cases of sesamoiditis can heal completely with careful treatment. There are two methods for treating sesamoid problems, nonsurgical treatment and surgery. Surgery is most often used as a last resort, when other forms of treatment aren't helping. Doctors prefer to begin with nonsurgical treatment. Your doctor may recommend treating the inflammation and pain of sesamoiditis with nonsteroidal anti-inflammatory drugs (NSAIDs), such as aspirin and ibuprofen. Special padding in the shape of a J can be placed inside your shoe to ease pressure on the sesamoids as you stand and walk. You may need to limit the amount of weight placed on your foot when you're up and about. Shoes with low heels may also ease the pressure. Occasionally, doctors inject steroid medication into the soft tissues around the sesamoids to decrease the inflammation. Some doctors place a patient with a fracture in a cast for about six weeks. Afterward, the patient must wear a stiff-soled shoe until the pain goes away. The stiff sole of the shoe keeps the toe steady and prevents it from bending while you walk. Other doctors prefer not to cast fractures. Instead, they have their patients wear a stiff-soled shoe right away. Stress fractures are a bit more complicated. If a stress fracture doesn't heal, it becomes a nonunion fracture, an extremely painful condition that can cause significant disability. If the problem isn't better in eight to 12 weeks, surgery may be needed to remove the pieces of unhealed bone. To avoid the problems of a nonunion fracture, some doctors use a cast and require patients to avoid putting any weight on the foot for up to eight weeks. If surgery becomes necessary, several procedures are available to treat sesamoid problems. Which one your surgeon chooses will depend on your specific condition. Your surgeon may recommend removing part or all of the sesamoid bone. When bone is removed from only one sesamoid, the other sesamoid bone can still provide a fulcrum point for the toe flexors. However, if both of the bones are taken out, the toe flexors lose necessary leverage and can't function. When this happens, the big toe will either bend up like a claw or slant severely toward the second toe. Thus, surgeons usually try to avoid taking both sesamoids out. Surgery is similar for the sesamoid closer to the middle of the foot. The only difference is that the surgeon makes the incision either on the bottom of the big toe or in the web space between the big toe and the second toe. For patients diagnosed with stubborn plantar keratosis, surgeons generally perform surgery to scrape off the extra tissue. Your surgeon may decide to shave off only the affected part of the bone. The bottom half of the sesamoid is cut off, and the rough edges of the remaining part of the bone are filed with a special tool to leave a smooth shell. This surgery is easier on the body than procedures that completely remove the sesamoid. When patients continue to have problems with nonunion stress fractures, a bone graft may help the parts of the bone heal together. 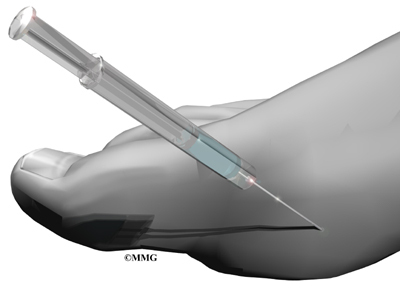 Surgeons mostly use this type of surgery for high performance athletes to keep the fulcrum point intact. The surgeon makes an incision along the inside edge of the main joint of the big toe. This exposes the sesamoid bone. The surgeon gathers small bits of bone from a nearby part of the big toe bone. The bone fragments are then packed into the unhealed area of the sesamoid. The soft tissue surrounding the sesamoid is stitched closed. Then the soft tissues are laid back in place, and the skin is sutured together. Patients with sesamoid problems may benefit from four to six physical therapy treatments. Your therapist can offer ideas of pads or cushions that help take pressure off the sesamoid bones. If simple modifications are made to your shoes you may be allowed to resume normal walking immediately. But you should probably cut back on more vigorous activities for several weeks to allow the inflammation and pain to subside. More aggressive treatment may require you to use crutches for several weeks to keep weight off the foot. Treatment is more cautious after bone graft surgery. Patients usually wear a cast for up to four weeks. Then they wear a short walking cast for another two months, at which time active exercises can start. About 12 weeks after surgery, surgeons begin computed tomography (CT) scans on a regular basis to keep track of how the bone graft is healing. The CT scan uses X-rays that are interpreted by a powerful computer to create images that appear as slices through the body. With a CT scan the surgeon can see the bones of the sesamoid better to determine if it is healing. 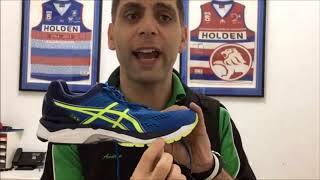 Join the Foot Discussion Group!